In the taxi going to meet Hau to pick up my "new" motorcycle, I'm actually excited! 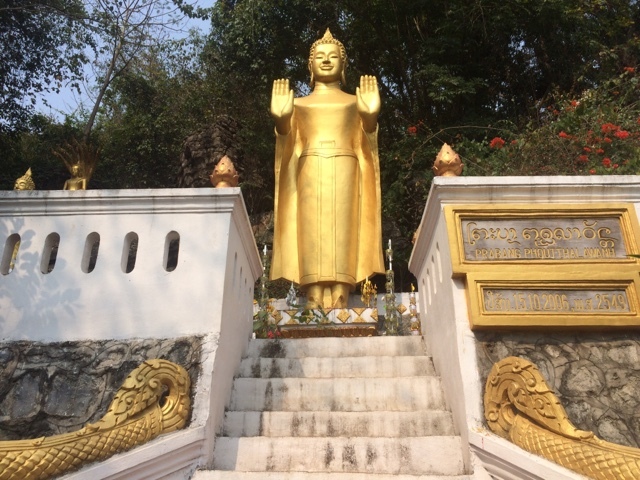 Since I returned from my adventure in Laos just the day before (17 February), he was kind enough to put of family matters and meet me this morning, the 17th anniversary of his father's death. As I explained in an earlier post, most Vietnamese people can tell the date of the three previous generations of ancestors' deaths more readily than the birthdays of immediate family members. This is because they believe that the quality of the ancestor's afterlife is at least in part determined by the size of the party in both people and food given every year to celebrate the ancestor. Hau's time this morning is very valuable and I am honored that he is taking some of it to deliver my motorcycle to me. I was right to be excited; the DR-Z is great! And pretty, if you like yellow :-) It's not my first choice, though the graphics Hau helped me add make it more tolerable. There will certainly be no valid, "I didn't see you" excuse! I like the bike a LOT more now, even though there is an issue I need to resolve on my next trip to HCMC... while the right side is fine, the left side graphics do not align properly from panel to panel. Hau was pretty sure I would object, though in the hope that I'd been here long enough to accept it, he let it slide. We talked about it and he has promised to make things right. Even though it is the same engine displacement (400cc), because it is an enduro (combination street/off-road) it is a totally different feel than the Honda Steed... and I like it! It sits up a LOT taller than the cruiser and although the higher center of gravity takes a bit of getting used to, I rode around the streets of HCMC enough before leaving for Dà Lạt that I feel comfortable enough to tackle the 300km ride. Hau did a great job of getting it ready and even added something that I came up with... a 10cm PVC tube mounted opposite the exhaust that will hold tools--a panier of sorts. 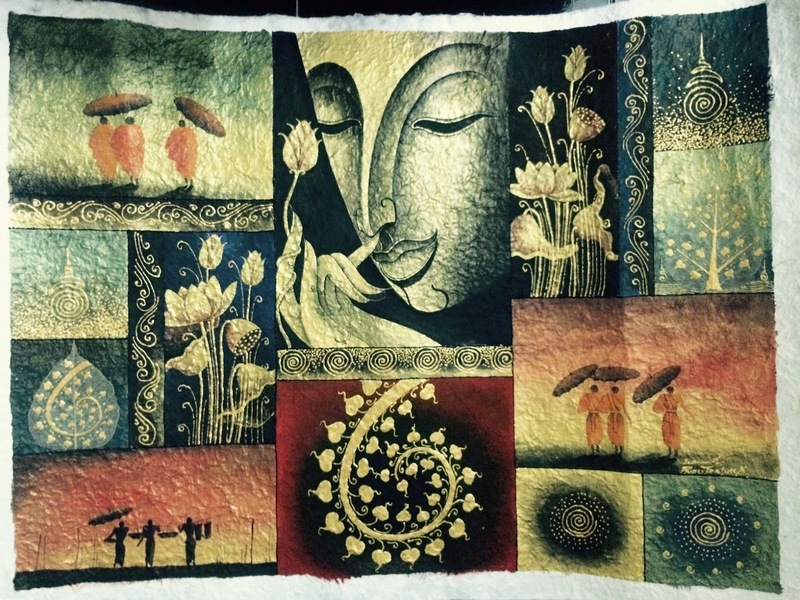 Then, looking closer, I was VERY GLAD that I'd left it empty and especially that the paintings I bought in Luang Prabang were just a little to long to fit. During my ride, the suspension travel put the wheel up against and, eventually, through the tube! Okay, it was a good thought with bad placement. There really isn't anywhere else to put such a tube, so I'll devise another way to carry the tools on a trip into the boonies. Maybe placed in a pack that I strap to the rack behind the seat? That's the standard practice, probably because it works. Hey, I tried, right? The good news is that all it cost me was US$2 worth of PVC. It will be better for most of the areas around Dà Lạt because of all the hills and roads with less-than-optimal traction/stability. My new friend Eric also has an enduro and has promised to take me to some of the areas that he and his friend ride, so I'm looking forward to that. 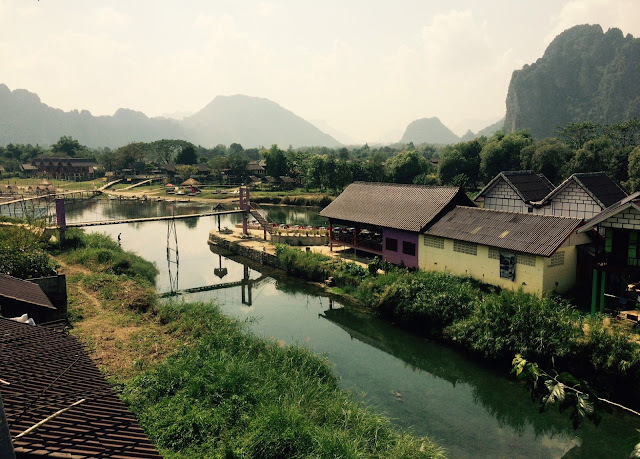 Sunday, 15 February, my day in Vang Vieng, was one of quiet relaxation. These structures are popular in the guesthouses and bars of VV, though at my age it takes a few well-placed pillows to make them comfortable. I've never been a fan of the stress put on the lower back by sitting with legs stretched out flat in front of you and even designed my teardrop trailer with a footwell to avoid this position. Fortunately, the place was less-than-full, so I was able to grab enough pillows to make it quite comfortable. 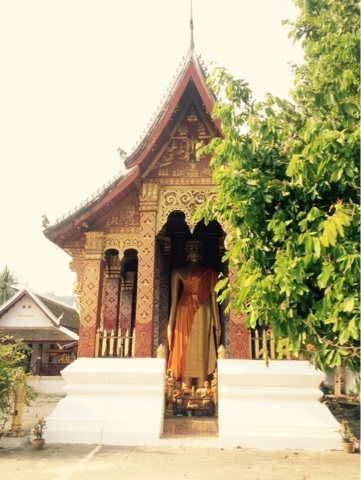 Between this perch and another, I sat and relaxed and read and wrote most of the Luang Prabang post... all day! It was great! I'm liking this new permanently-on-vacation-in-paradise life..
even when it's more of a backpacker's idea of paradise than mine. Later, after walking back to Jammee's for a shower, I thought about heading back to Amigo's Mexican Food for dinner. Instead, I wandered a bit debating my options and ended up at Gary's Irish Pub. After listening to an Irish accent tell me about the fish and chips, I ordered it. I ate the fish, leaving most of the HEAVY breading for the garbage it was. I doubt I'll return to VV, though if I do, I will be sure to steer clear of Gary's... at least for what he calls food. The next morning I breakfasted early and was again on the road by 8:30. Okay, it was really 9:05 before I headed out of town. James requested that I get the chain oiled after every second day of riding and since I didn't do it when I arrived, I wanted to get it done prior to departure. 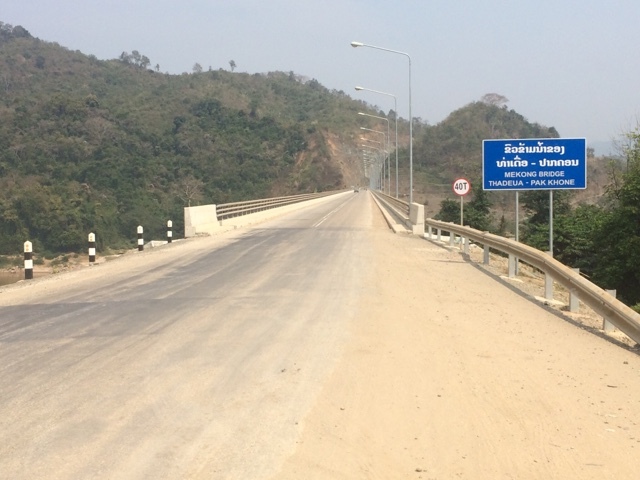 Vientiane is only 160 km or so away, so I have plenty of time. It took me a couple tries to find a shop open where I could get the chain lubed and this time was even more interesting (and fun) than the previous. The family was eating breakfast in the shop when I rode up and as I dismounted, a young man approached me. I squatted down, pointed to the chain, and said, "Oil chain." He smiled, nodded, and picked a catch pan of the floor nearby. 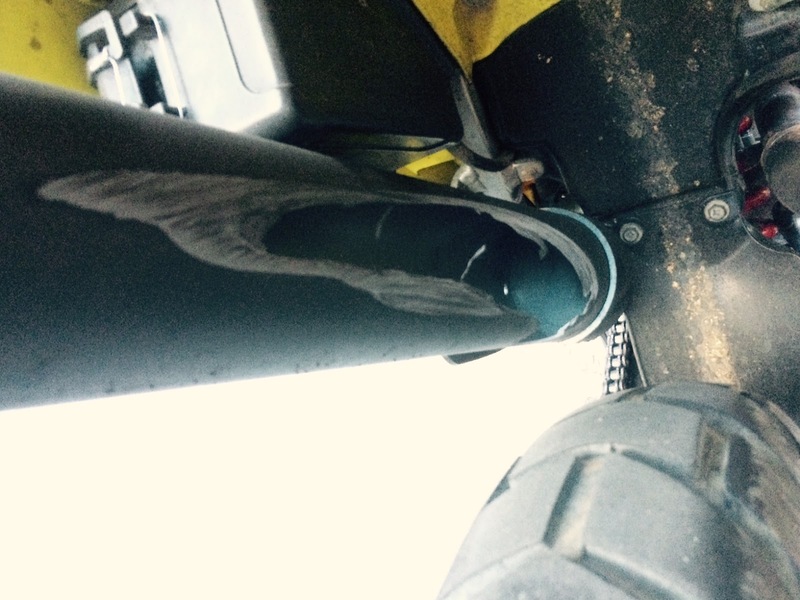 As I thought, "Wow, they're so tidy that they even catch excess chain oil! 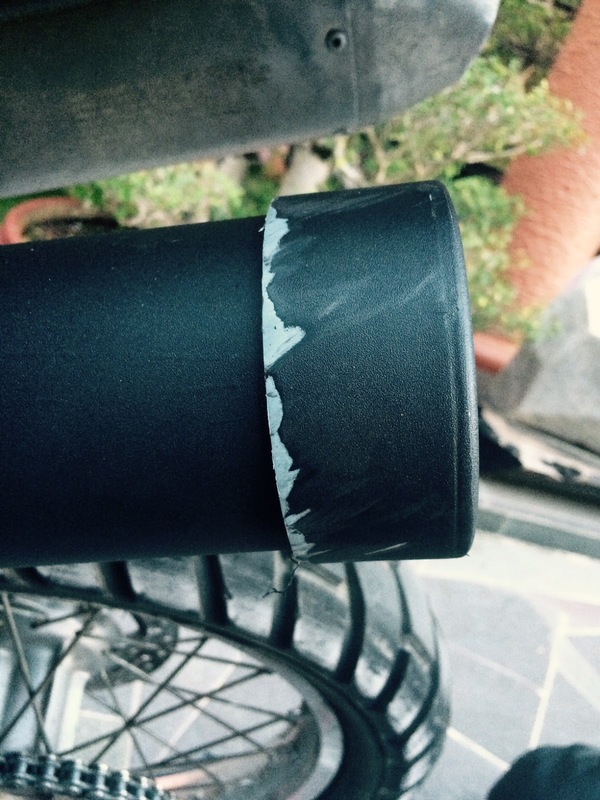 ", he put the pan under the drain plug and started to go back for tools. I said, "Not oil change, oil chain." Are you laughing, yet? If not, you need to spend some time in SE Asia where they have difficulty saying our soft g and apparently also hearing it, though I'm betting even a native English speaker would be hard-pressed to hear the difference sometimes. Like now. I gestured for him to come join me on my side of the bike where I was then able to point to the chain and make a hand gesture that I hoped he would see as pumping the oil can—hold your right hand closed with forefinger pointing out (spout of oil can) and thumb on top. Then move the thumb up-and-down like flicking a BIC and you'll see what I did. He got it and went to find the oil can. After I balanced the bike on it's kickstand so the rear wheel could spin free, he oiled my chain. Thank you! 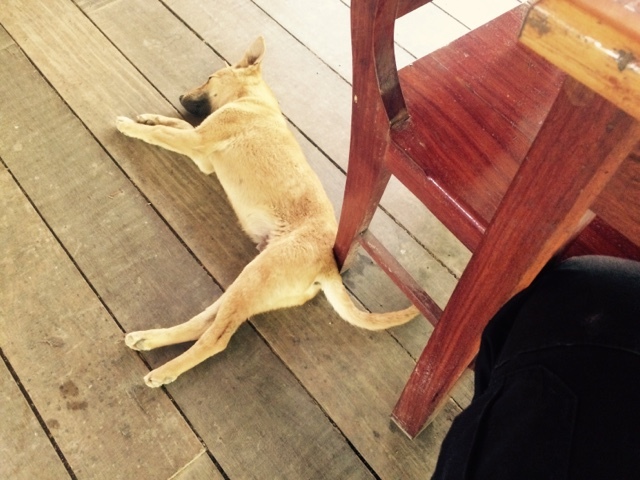 This time he thankfully had little problem asking for 8,000 kip (US$1) which I gladly paid. Then came the fun part... the father, who'd been watching all of this and smiling at the appropriate moments (as had the entire family), approached me with his daughter (~20) in tow. He pointed to the rear sprocket and she asked, "How do you say in English?" Sprocket. Rear sprocket. 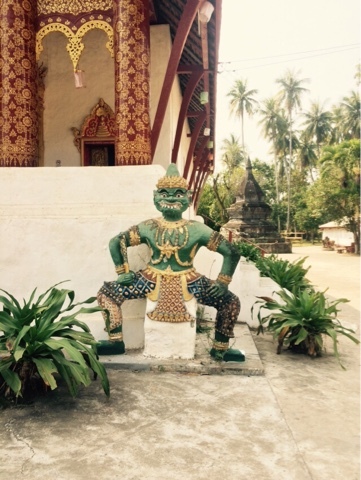 He smiled, said "Khop chai." and went back to sit down. 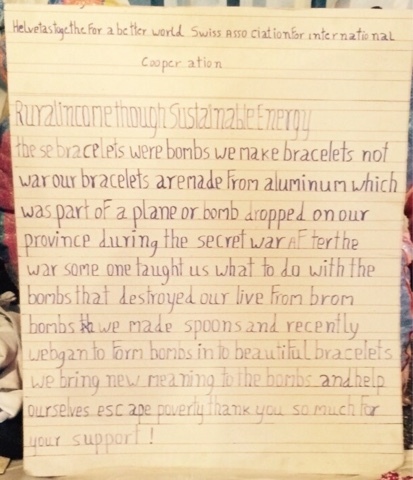 The daughter stayed with me and while making a writing-like gesture I asked her if she would like me to write it. She said yes and between the two of us we procured pen and paper. I printed "sproket", crossed it out and wrote "sprocket". Without quotes, of course. Next she pointed to the chain (she hadn't seen when I earlier pointed for her brother), said "This?" Chain. I wrote it. We then covered the front brake disc, calipers, and pads, as well as the wheel spokes and clutch lever, all of which I printed for her. Then she asked if I am a mechanic. Suppressing a laugh into a smile, I said, "No, I just know enough for a small emergency." She translated and the family shared my smile. Thanking them all again, I said good-bye and gave them one more smile as I promptly stalled the bike while trying to ride off. Today's road was straight forward and uneventful. Though there were some nice scenic spots, I didn't stop for any photos. and, even though I was hungry an hour out, I made myself wait 'cause it would be worth it—I might even have two! I found the shop straight-away, pulled over to park and saw... "CLOSED"
DAMN! Then I remembered that it was Monday and, chances are, like hair salons in the U.S., it's the only day they're closed. Greatly disappointed—I fly home too early in the morning to have one—I rode to the Avilla Phousk Hotel and checked in, once again turning down the first room offered and ending up with a nicer, quieter room. Once settled, I headed out for a bite to eat. I needed to be back at the hotel to meet James, turn over the bike, and collect my passport at 3:30. James arrived 25 minutes late and blamed it on traffic. Since I knew you can ride from one end of town to the other in 15 minutes and he'd earlier told me his shop was close, I figured this was his attempt to save face. 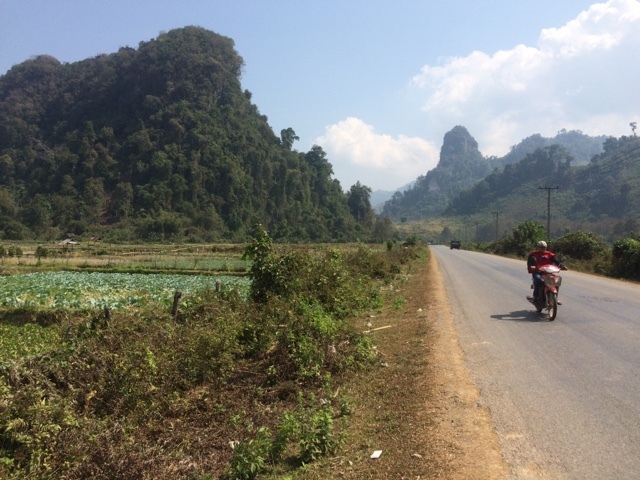 He asked how the bike was, "Fine"; how the trip was, "It was good"; and what I think of the roads in Laos, "Much better than those in Việt Nam!" His reply, "No, they're NOT!" Why do some people ask your opinion and then tell you that it's wrong? WTF? It's MY opinion! You might disagree and that's fine, but, you self-righteous prick, DON'T tell me I'm wrong when you don't know me or the basis for my opinion. My reply? 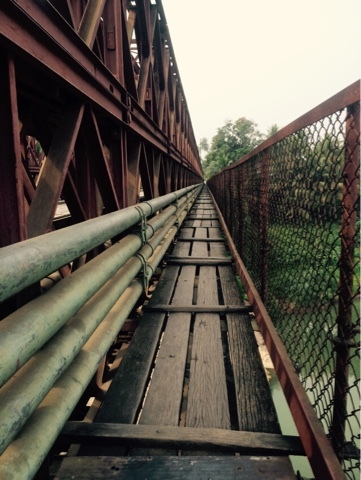 Then you've not ridden very much in Việt Nam... He laughed sarcastically and said, "I can't believe how many people tell me that!" 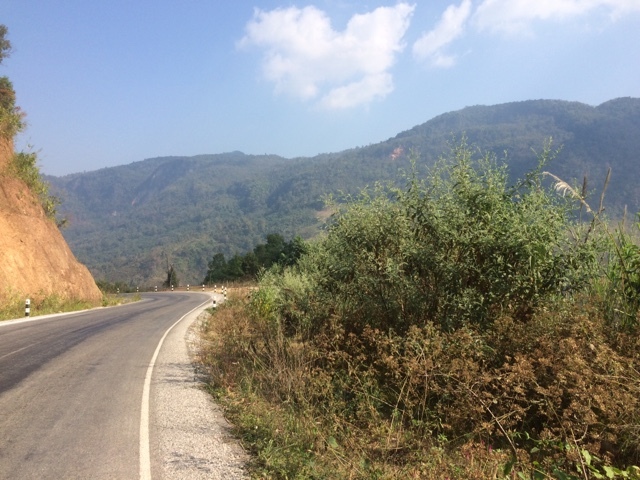 and proceeded to list a bunch of great roads in Việt Nam, all of which are north or west of Hà Nôi and none of which I've ridden. 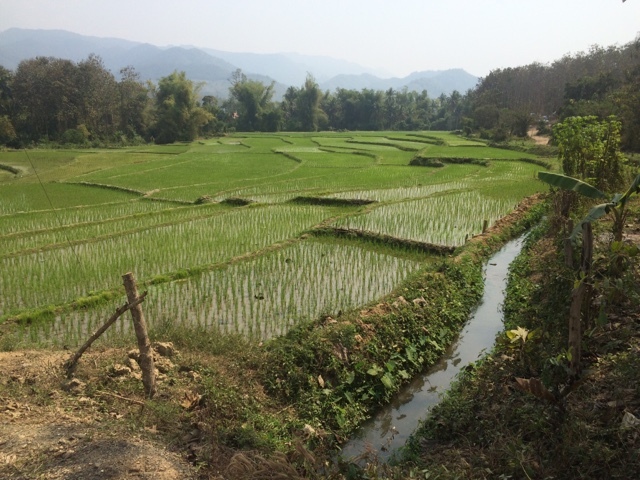 Well, pandejo, I've ridden 2500 km in VN and maybe 40 km of those roads are as good as the roads I rode here. (I used my internal voice for that part; at this point, he still had my passport). I guess it hasn't occurred to him that there may be a reason many people have the same opinion that is the opposite of his. My face-to-face experience with James tells me that I will NEVER again do business with him. His people skills are those of someone who is used to bullying people to get his way and there is no room for that crap in my world. As the saying goes, "I wouldn't piss on him if he were on fire." As soon as I had my passport in-hand, I excused myself and went back inside the hotel. The next morning I took a cab to the airport and headed back home. The visa-on-arrival process went smoothly, though slowly, and I got to have dinner with Nhi, her brother, and her son, Thịnh, who's visiting from her home town. I'm writing this from Sin Viet (138 Bùi Viện), my favorite place in HCMC for a Western breakfast. 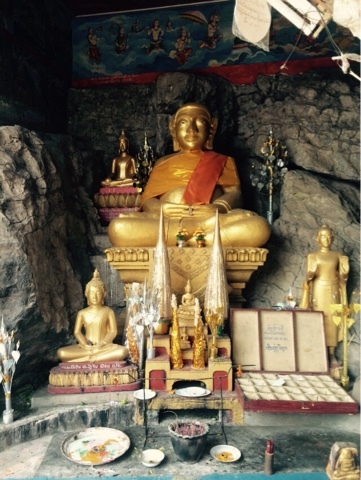 All is well and I'll spend a week here before heading back to Dà Lạt on 24 February. Thanks to the recently-paved road connecting Highway 4 to 13 at Kasi that I mentioned in a previous post, there are two options for LP-VV. The first stretch is the same, and then 13 bears left while 4 goes right. I took 4 because I wanted to try the new part and (mostly) because it is ~4 hours vs. the ~6 hours on Highway 13. Early in the ride I was passed by a Vietnamese-licensed SUV with "QT" in red as part of the otherwise black license number. With # standing in for whatever the numbers were, it read ##-QT-###-##. I have no idea what that signifies, though I definitely never noticed one like it in all my months in VN. The Reise map shows the shorter route, indicating the first 10% and the final 60% as "Other" with the 30% between as "Track/trail". I can assure you that except for a few hundred meters, it's now a "Secondary" road. Once the map is updated, it will most likely show the entire 68 km as "Scenic" as well. 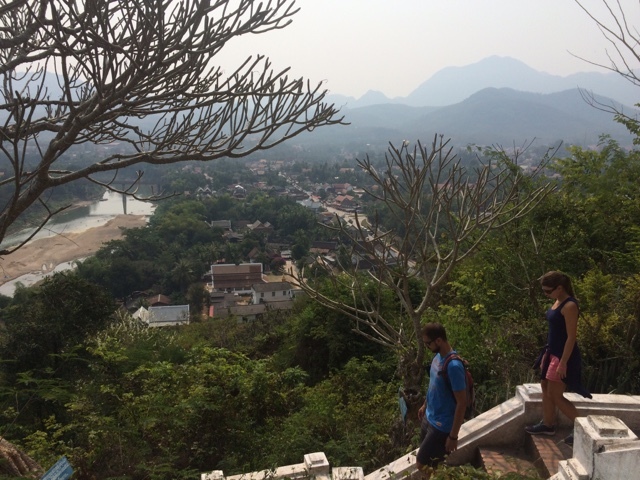 Total travel time from Luang Prabang was about 4.5 hours including a number of stops for photos and one for nectarines. A few kilometers in from Highway 4, there was a tour bus broken down and blocking the opposite lane of traffic. A tow truck was backed up to it and in the process of removing the engine. My guess Is that's because they don't have a truck powerful enough to tow the bus over the hills, so they remove the engine, take it somewhere for repair/rebuild, then reinstall it. I've certainly never seen a tow truck even as big as the one pulling the engine. It was definitely too small to haul the bus up these hills. Speaking of kilometers... why to some people (like me) say, "kil-ah-mit-r" and others say, "kee-low-me-ter"? Is is accent? Or is it, as I have convinced myself, that we who use the first pronunciation think of it as one unit, a "kil-ah-mit-r" and those who use the second think of it as 1,000 meters... a kilo of meters? Another question I've had time to ponder... At what AGL (Above Ground Level) do hills become mountains? Is it a "mountain" if it has sheer cliffs on the side? Does haze make them seem more like mountains? The protrusions here look like what I would call steep and craggy hills, though they could also be described as small mountains. As you can see from the above photos, the ride was picturesque. What I am unable to show you with photos is how technically challenging some of the curves were. More than once I entered a decreasing radius curve a little too fast and got to use a little engine braking and a little braking to realign myself. After a while I realized that I was riding maybe 20% slower than I could in subconscious anticipation that every curve was such. They weren't, of course, though it did allow me to enjoy the scenery a bit more. 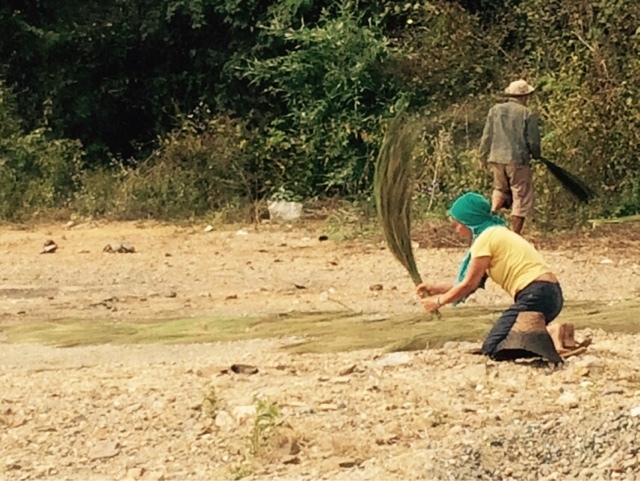 There are a couple spots in the road close to Van Vieng where the locals sell various items from crudely-made stands. The item that caught my eye was nectarines and after passing a LOT of stands, I promised myself that I would stop at the next one. Fortunately, there was a next one... and I pulled over. The second thing I noticed (after the fruit) was a little girl (maybe 2) wrapped up in a quite intense crying jag. As one of the women weighed my kilo of oranges, I pulled a bag of peanut M&M's out of my jacket pocket and offered one to the little girl. She stopped crying and looked at me as if to ask, "WTF is THAT?" So I popped another out of the bag and into my mouth. She stared at me for a few seconds... "He's not keeling over, so it might be safe" before putting her's into her mouth. I'm guessing it's the first M&M she's ever seen, so I poured out three more and held them in my open palm. She grabbed them without hesitation. Her Mom tried to get her to say "Kop chai", but she wasn't talking so Mom said it for her. There were smiles all around as I remounted and rode away. According to an overheard conversation my first morning here, 10 years ago there were only two guest houses here in Vang Vieng. Now, they are omnipresent. The place I landed is one you would almost certainly never see if you just started walking the strrets and looking for a room. I'm very glad I did a bit of searching on-line a few days ago. 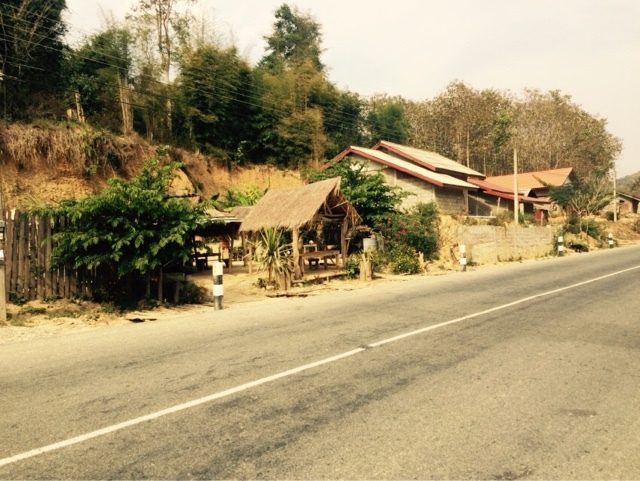 Jammee's Guesthouse (found on Agoda.com) is on the edge of town and very quiet. I booked triple 'cause it's all they had available on-line. At first he put me in a double on the ground floor near the entrance because he thought that I would not want to be above a room with children who wake up at 6 a.m. Since I was paying more for the triple, I asked to see it—and immediately decided that the nice balcony overlooking nature and a lightly-traveled gravel road to the river would more than make up for the possible early wake-up call. Rooms 7, 8 (mine), 9, and 10 are the only ones here with a balcony. Note: If you are okay with a 1 km or so walk to "the action" in VV, stay at Jammee's. The place is quiet, the staff very accomodating, and the included Western breakfast is quite good. After a short nap to help compensate for only five hours' sleep last night, I took a walk in search of a very late lunch/early dinner. This is DEFINITELY a backpacker town! A 21st century dusty, dirty, frontier town for The Entitled Generation. 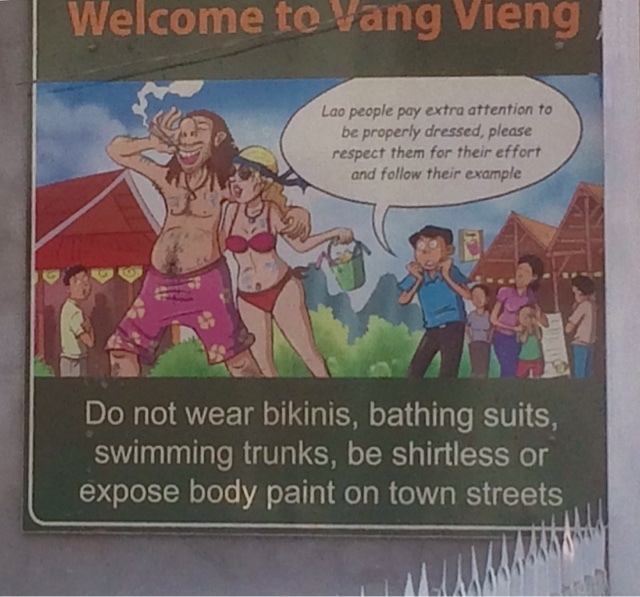 Despite the numerous signs asking visitors to wear proper clothing on the street (more than bathing suits) as a sign of respect for the locals who put thought into how they dress, fat-assed young women in bikini bottoms and clueless stud wannabes with bad tattoos so numerous they apparently take the place of the requested shirt are everywhere. but they look ridiculous on guys. To the guys who think you look cool... you do NOT. They're almost as stupid as a backward baseball caps when you're not looking through a camera viewfinder or playing catcher in baseball. Someone needs to tell you that the girls you're trying to impress will be too busy laughing AT you to ever get nekkid with you. 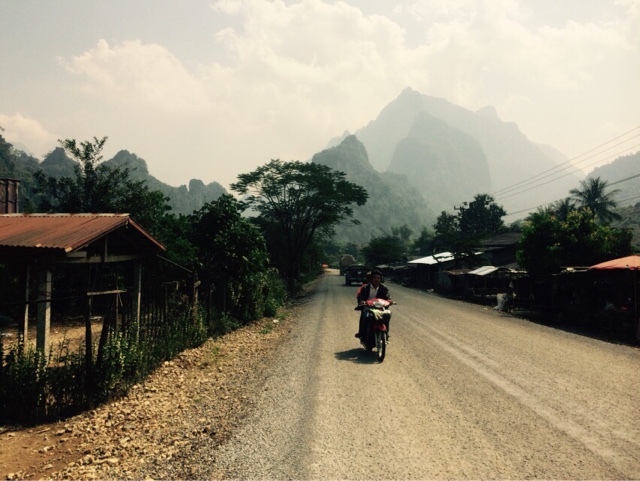 With the omnipresent dust, Vang Vieng is grungier than Bùi Vien on its worst early morning, though it does lack the piles of litter and trash. It has tons of bars, including side-by-side backpacker bars with double HUGE screen TV's playing "Friends" at one and "American Dad" or something like it at the other. Lots of mom-and-pop places with NO customers. I wandered until I saw a sign saying, "Amigo's Mexican Food, 50m —>" at which point I strode purposefully. I haven't had Mexican food since October and hoped it would be authentic. 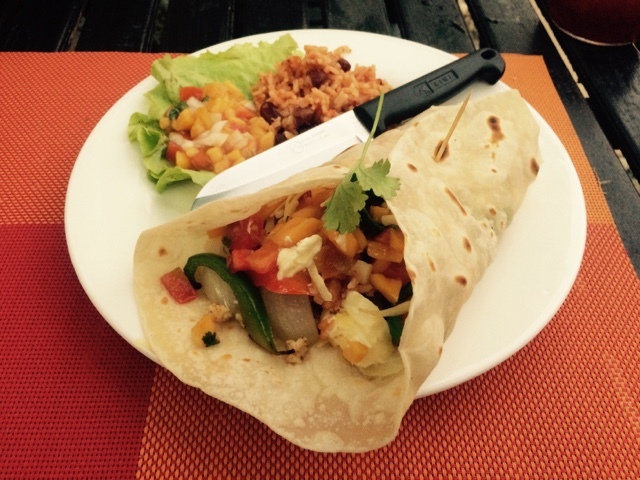 Amigo's Mexican Food restaurant is on a side street about halfway between the main drag and the backpacker street. It was empty, save for two 20-somethings at the bar, so I asked the very personable bartender/server/bus person if they had Beerlao Gold or Beerlao Dark? "Yes, I can make it." Okay, I'd like one, please. 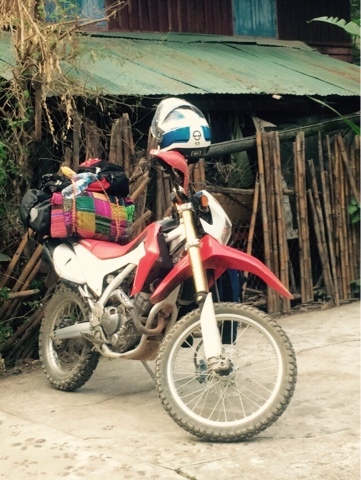 Click here for my route from Luang Prabang to Vang Vieng... EXCEPT that I went across the Old Bridge and turned left at the T-intersection, then right to pick up the route shown. Google Maps does not allow for driving over the Old Bridge and they're right if you're on anything wider than a motorcycle. Before I forget, here's an article from the Vientiane Times about the Elephant Festival. 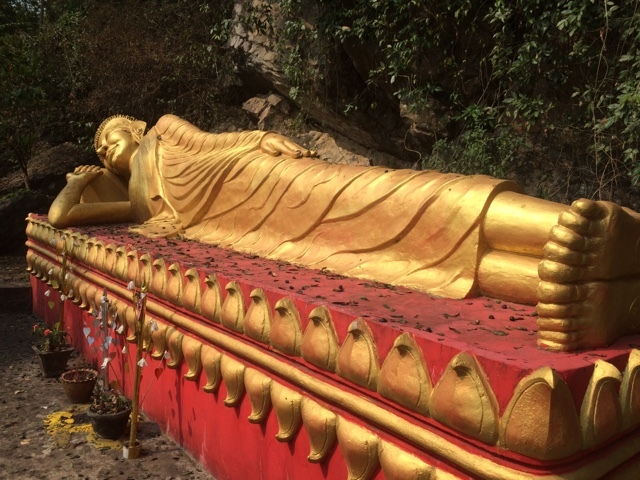 I spent three nights and almost three full days in Luang Prabang. I could've stayed three weeks! After checking into the guesthouse, I took a shower. It was during that shower that I figured out that the on-demand water heater is unable to keep up with the full volume put out by the piping, so you can have a cold shower at full flow or a warm shower at half flow. I chose warm. If I'd figured it out a day sooner, I could've had a warm shower in Sayabouli, too. Walking into town, I stopped for a late lunch and a beer. 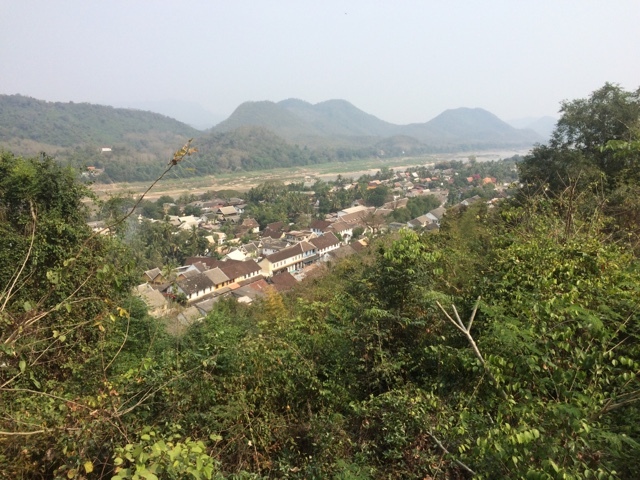 Then, to familiarize myself with downtown Luang Prabang, I walked. And walked... occasionally stopping into a shop to look around. LP's Night Market takes over their main street every night and features hundreds of individual vendors with a huge variety of products, most of which are Chinese-made crap. Sorting through the chaff to find the good stuff takes some doing and some knowledge. My first suggestion is to walk through once before stopping to look at anything. This will take 30 minutes or so and will allow you to see that many of the pieces you thought were locally-made are not. 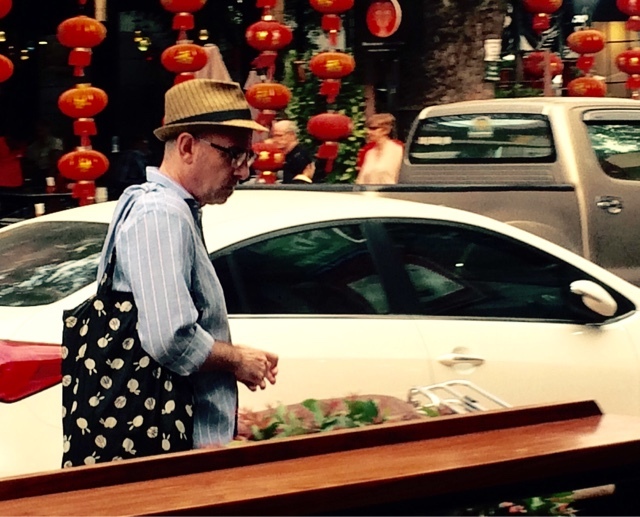 If more than one vendor has similar or identical items, pass them by... unless you need a new mass-produced in Việt Nam bag to carry your multitude of purchases home to Việt Nam. One vendor I did stop to talk with had a product over which I almost cried and about which I will always feel heartbroken. I do admire their attitude of making lemonade from lemons... I wish them well. They are, unfortunately, not the only vendors with these items. We dropped 2.5 MILLION TONS of bombs on Laos including over 270 million cluster bombs during the secret war we waged on them in the 60's and 70's, so these peaceful people have plenty of raw materials. 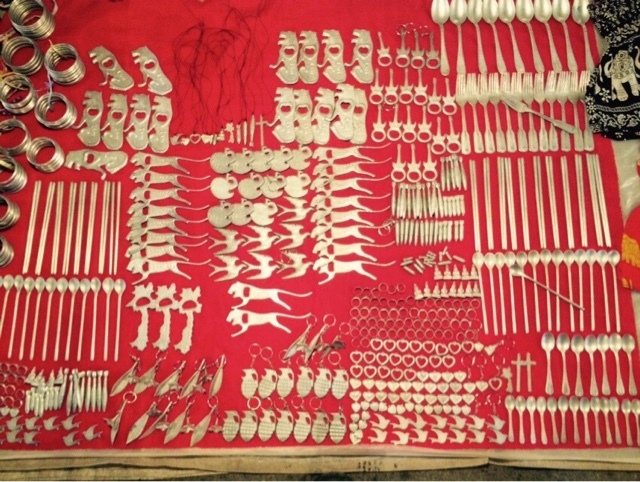 Though I didn't buy anything (and recommend you DO NOT USE an aluminum eating utensil of any kind), I did apologize for the atrocities suffered on their people by my country and donate 100,000 kip. 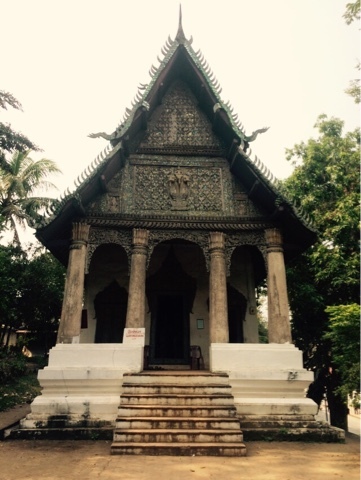 As was the temple at the National Museum. While in LP, I had a cup of tea and a small bite to eat at a number of places. Tangor Restaurant, Bar, and Lounge was by far and away my favorite. It's at 63/6 Ban Xiengmouane, Rue Sisvangvong, a copule blocks east of the National Museum on the opposite side of the street. My first visit I enjoyed the cerviche appetizer. The second day I spent a few hours sitting on the porch, writing for my blog, watching the world walk past, and occasionally chatting with those seated near me, some of whose names' escape me, so I'll forego mentioning any. I was completely blown away by Tandor's Goat Cheese Salad and ate two of the warm goat cheese rounds on sliced bagette topped with a slice of partially rehydrated sundried tomato before I remembered to take a photo for you. 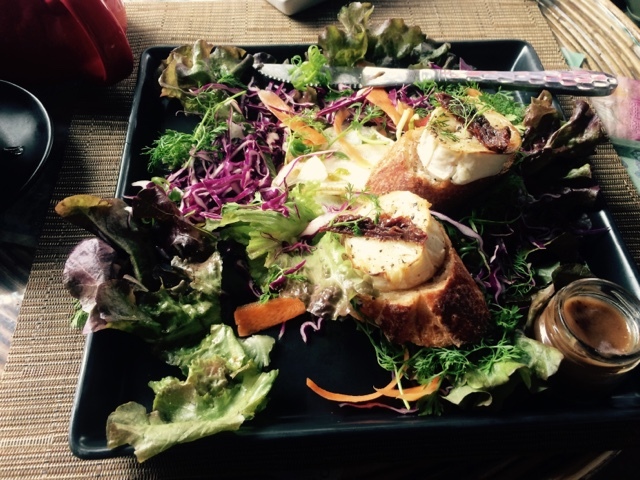 When you go to LP, go to Tangor and order the Goat Cheese Salad. You will thank me! 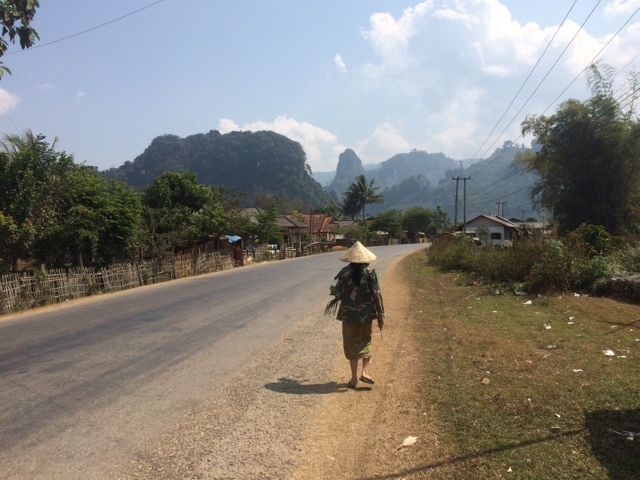 As I walked from my guesthouse to town the first day, I stopped in a wonderful little shop called "Kōpnoï—made in Laos" (Phommathat Road, five doors in from the intersection of Phou Si Road) in which everything is fair trade and made in Laos. I was lucky to get away without buying out the whole shop. They have hand-made clothes, blankets, jewelry, pillows, handbags, and many other items on the ground floor and original artwork on the second floor. The two artists featured are very talented and I came within millimeters of purchasing a two meter long piece that would look great in the house I just rented. They ship internationally with DHL; I may yet own it. 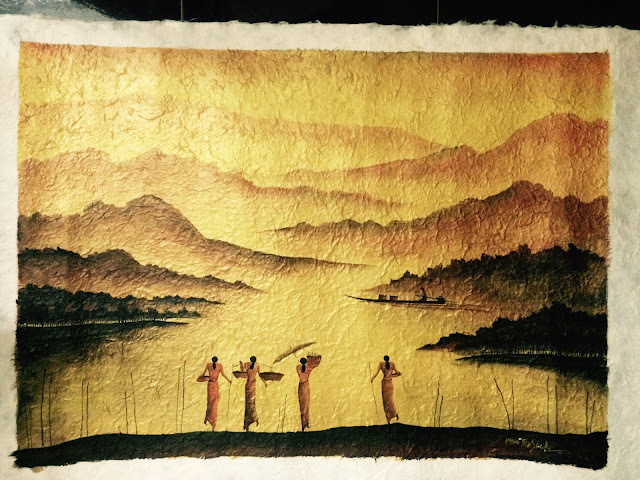 I did purchase a set of four roof tiles painted by the same artist and they will look great framed and mounted on the wall. 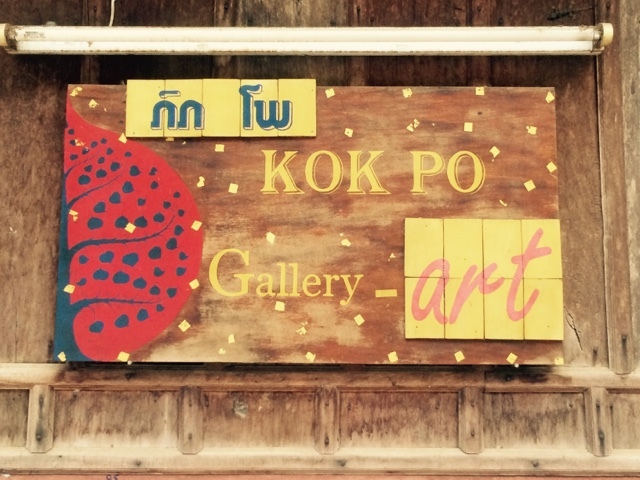 Just around the corner from Kōpnoï on Phou Si Road is a gallery/studio of another talented Lao artist, Kok Po. This is the sign above his shop. I found five wonderful pieces there and returned on my last day to purchase two of them. These photos don't do them justice, they're the best I can do with my iPhone. 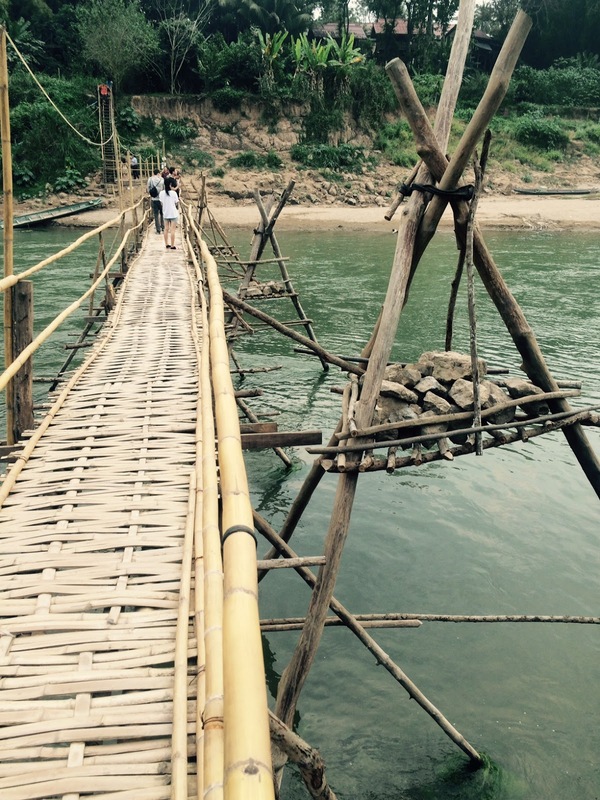 In addition to the Old Bridge, there is a bamboo foot bridge crossing the Nam Khan and I recommend trying it. It's only 5,000 kip per person per day... keep your ticket for multiple same-day crossings. A few more observations... the papayas, bananas, and watermelon I've had here are less sweet than the same fruits in Việt Nam. 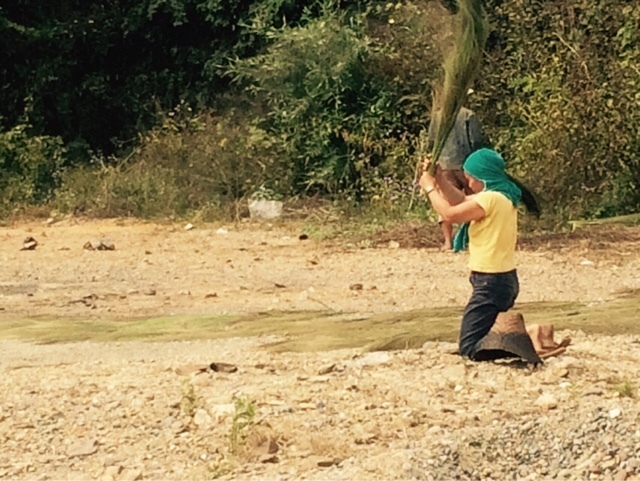 In Việt Nam, many people wear face masks to help filter out the pollution. Here, they are either not available or people cannot afford them because everyone I see who's trying to keep something out of his/her lungs is covering the mouth with a jacket or a sleeve or a hand. People in both countries park their motos across the sidewalk blocking it so people have to walk around them or out into the street; they make a LOT of noise very early in the morning or very late at night; is "how do my actions affect others?" a question people in SE Asia ask themselves? If you drink tea, bring a strainer with you. About 90% of the tea I've had here comes with the leaves still in the mug and it's a chore to dig them out. 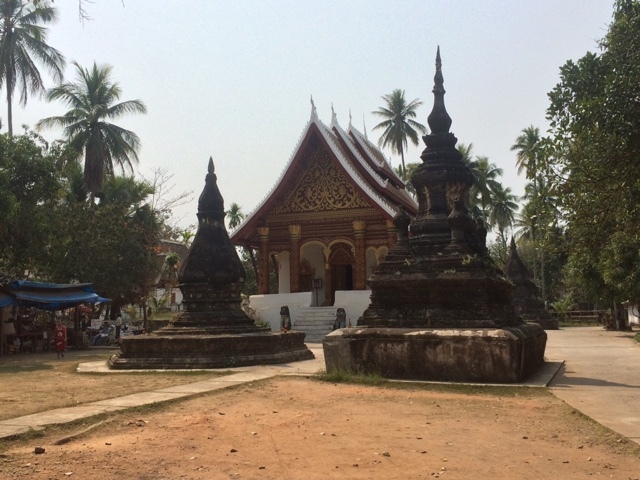 When I come back to Laos, it will be to Luang Prabang. I will hang out at Tangor and eat Goat Cheese Salas every day. 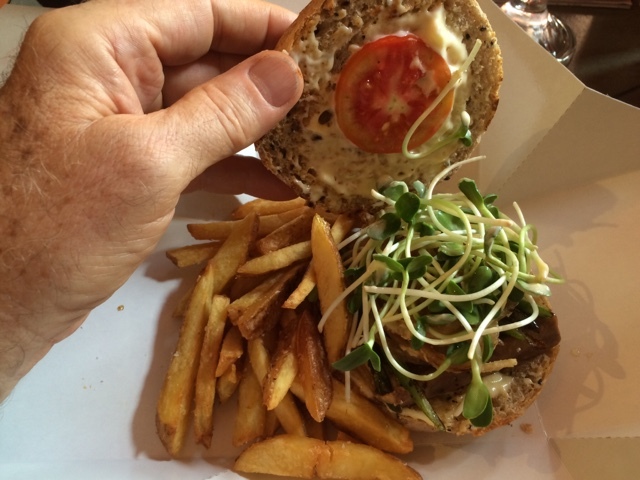 I will also find a way to have an occasional Satellite Burger. 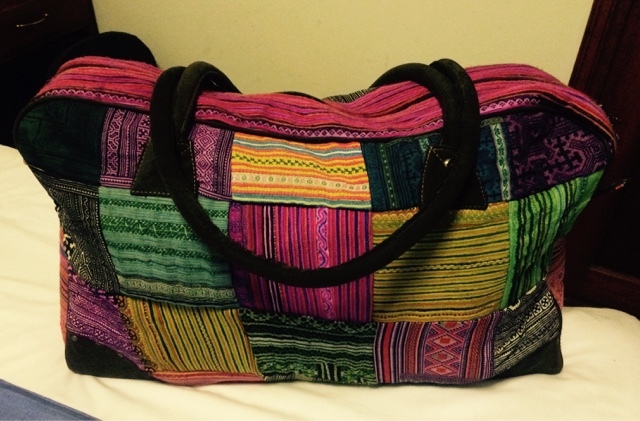 An early start is much easier if you're 95% packed before you go to bed the night before... I left the room early and walked back to the coffee shop where I'd met Richard the previous afternoon for a breakfast of green tea and shrimp fried rice. As I paid the bill and prepared to walk back to the hotel, Richard came in and we talked for a few minutes. 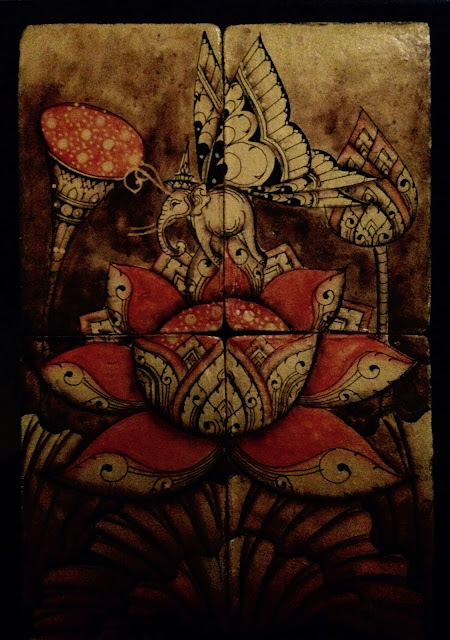 He suggested that I return Friday for opening day of the Elephant Festival and I told him I'd look into a room before I leave, though I'd imagine everything is long-ago booked solid. It's two trips to get everything out to the bike and as I headed back upstairs for my helmet, gloves, back brace, and boots, the guy who'd helped me relocate yesterday to a room with a better Wi-Fi signal held up my motorcycle boots from behind the reception desk. I hadn't yet realized that I left them behind when I changed rooms! Had he waited any longer to return them, I'm sure I would have turned the room upside down a few times looking for them. How could I have not noticed their absence? Sheesh! As I pulled out of the parking lot, I intentionally went off-route for a few shops until I came to a motorbike repair shop I'd spotted the previous day—time to lube the chain. It was a rather humorous two minutes before I could correctly pantomime to the guy what I wanted. The first attempt resulted in him grabbing a couple wrenchs and starting to take the rear wheel off. Then he wanted to take the chain off. I finally grabbed a bottle of oil from the shelf and made like I was pouring it on the chain... that got the message across. Then I remembered something I learned from Terence... I walked over to where his wife was nursing their very new baby. Note that I am assuming here. She was breastfeeding in the middle of the shop and mine was the only motorbike there, so I figured she was not a customer. I leaned over and put 100,000 kip note in the baby's hand. Money for the baby is ALWAYS accepted! One hundred thousand is probably about 20x what the service would cost, though since it's for the baby, I thought they'd be okay with it. I was rewarded with a HUGE smile from Mom and a handshake from Dad. Baby held the cash very tight... good baby! I rode 104 km to my hotel in LP. Most of it was fairly straight and easy riding, giving the mind a bit of time to wander. 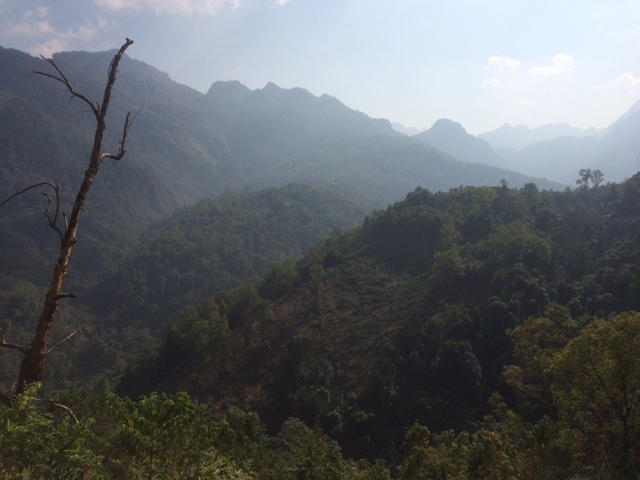 Some of that wandering compared my five days' of superficial impressions of Laos with the Việt Nam I'm getting to know. 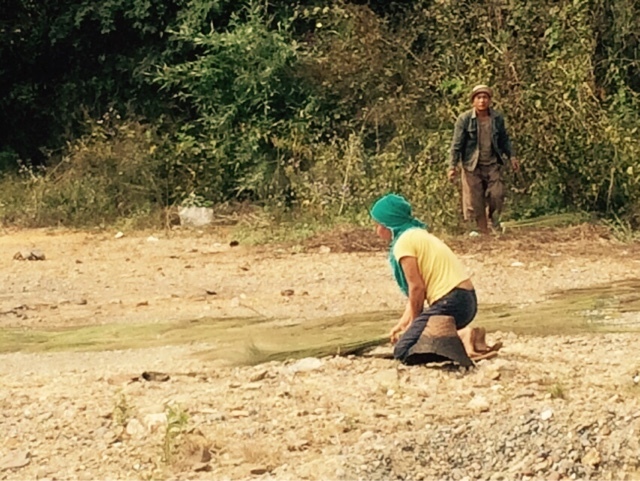 My initial thoughts are that the Lao people are more laid back, reticent, and quieter, though just as hard working. 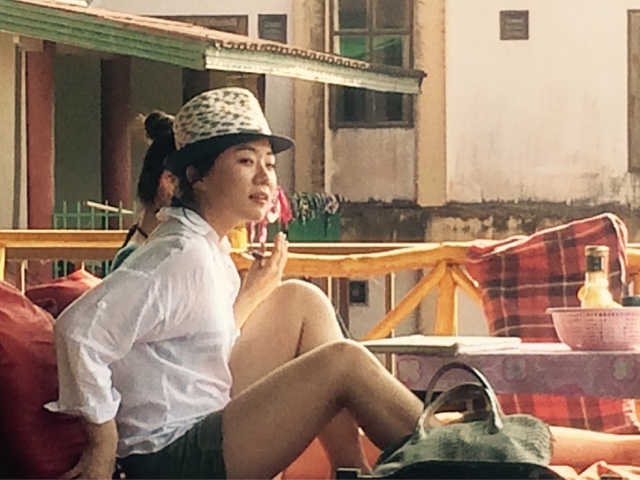 Smokers are even less evident than in the U.S. and nonexistent compared to Việt Nam. The cities are much smaller, traffic is NOTHING here compared to Hà Nôi or Sài Gòn or even Đà Lạt, due both to population and the much smaller percentage of people here who motorbikes. Based on my own unscientific observations, I will postulate that there are maybe two or three motorbikes per four-wheeled vehicle versus the 18 or 19 per in Việt Nam. I can walk through a market, or into a store, or encounter a street vendor, without being bugged to insanity to "Buy something, buy something!" If you make eye contact or look interested in what they're selling, they will say, "Sabadee..." (Hello) and wait for you to speak. 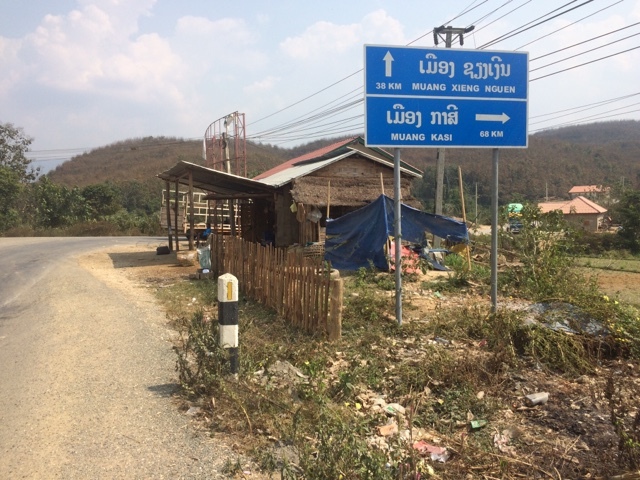 For the most part, the Lao people seem to both know and follow the internationally standard rules of driving/riding on the roads, e.g. taking turns, riding only on the right (as opposed to left) side; looking over their shoulder prior to turning left across traffic or right into traffic, and then actually waiting until there is an opening before going rather than just GOING and letting the traffic make room for them; and turning off turn indicators after completing the turn (if used at all). AND, most important… the roads are in outstanding condition compared to where I've ridden in Việt Nam (most areas south of Hà Nôi) or around Siem Reap, Cambodia. 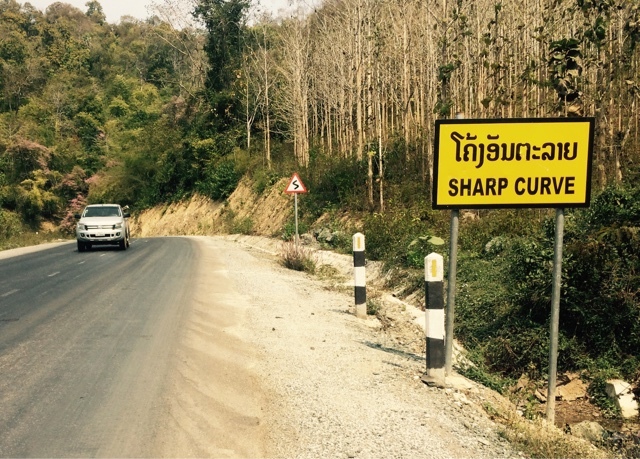 They even have directional signs in both the Lao language and English (most of the time) and give prior warning of most of the challenging curves. Still, I prefer VN. Maybe because it's familiar and I know more than two words of the language? 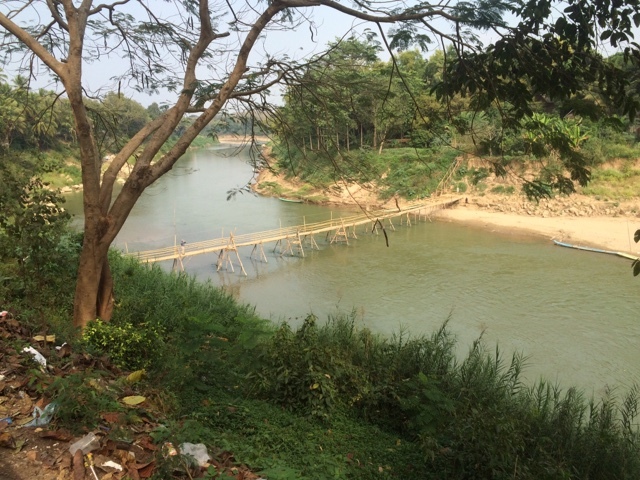 Both Google Maps and my Reise told me that on this leg of the trip, there is a ferry needed to cross the Mekong. No longer. 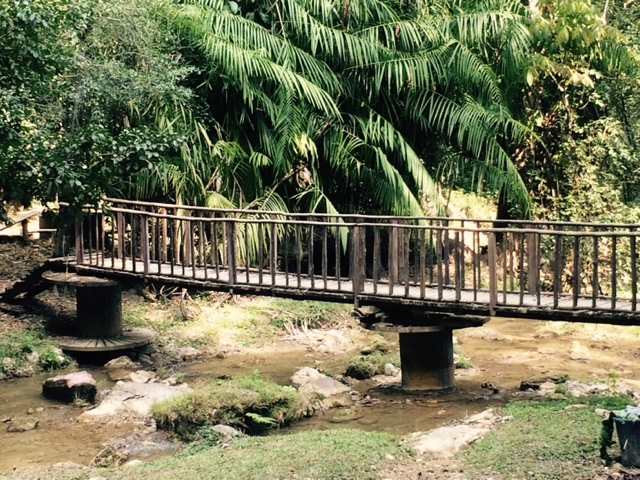 There is now a nice, new bridge crosses you high over the water. Every one of those little guys is planted BY HAND. Bend over, plant, stand up, pick another out of your stash, bend over... then repeat 100,000 times or more. I need a massage just thinking about it. We think we "work hard" sitting at a computer screen or waiting on customers all day? Really?!! On the way up I passed the road to Kasi that James mentioned. I LOVE how they mark junctions here! 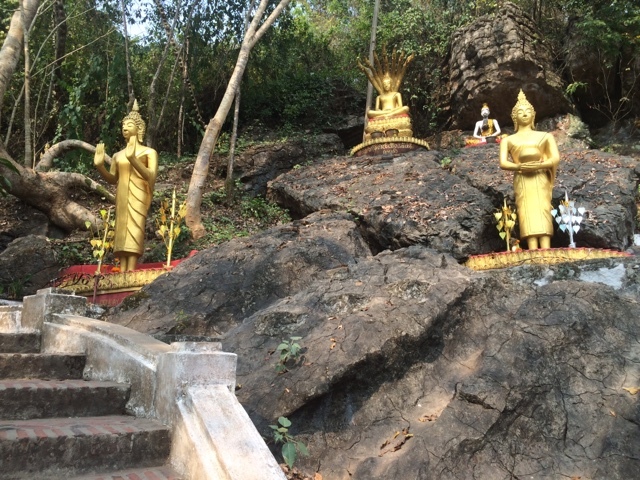 A little further up the road and about 60+ km out from Sayabouli, in a village called Ka Cham, I passed a sign for Kacham Waterfall (~40 km SW of Luang Prabang). It was a short ride today, so I had plenty of time… I turned around and went back. About 500m down a rutted dirt road (again glad for the enduro) I came upon a guard house with a swing up/down gate. I will put guard, paid my 30,000 kip entry fee, and waited as he moseyed out to lift gate for me. I could have ridden under it, but wanted him to feel like he earned my money. 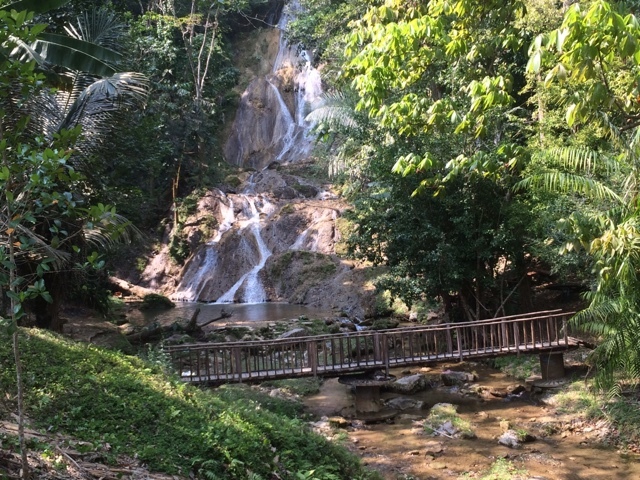 The waterfall is nice and the sound is very relaxing and tranquil. The bridge below it is supported by cable spools. I didn't cross it, though. It looks sturdy and there was really nothing on the other side that I saw worth walking over it. There's also an open-air restaurant whose employees like LOUD Thai music videos. They were nice enough to turn the volume down to about 10 as I walked in. Too bad, really, because it distracts greatly from the music of the waterfall. I ordered a papaya salad not realizing that it has meat in it. The meat looked raw and I was unable to… scratch that... I was unwilling to guess what it was. Leaving a few mystery meat morsels in my bowl, I paid the bill and got back on the road. 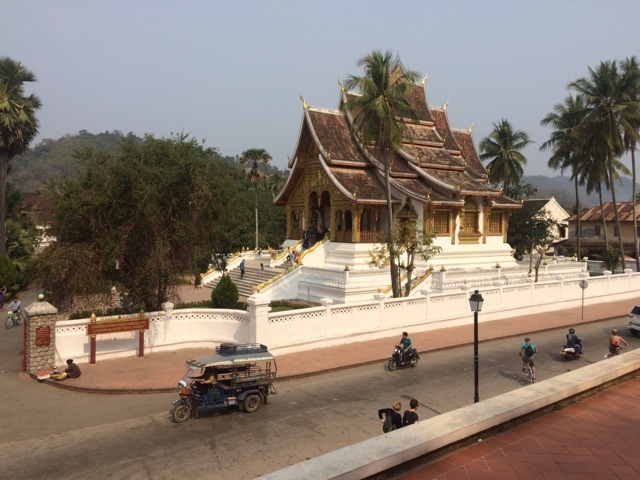 Early in my ride through Laos, I noticed that the architecture is noticeably different here than in Việt Nam. A majority of the homes in both countries are concrete block with stucco (or just painted concrete block). The rest of them are what I am now calling "organic architecture"—wood or bamboo—with the latter appearing the least structurally sound. Little of the organic I've seen appears to have any kind of protective coating or preservative in the wood. 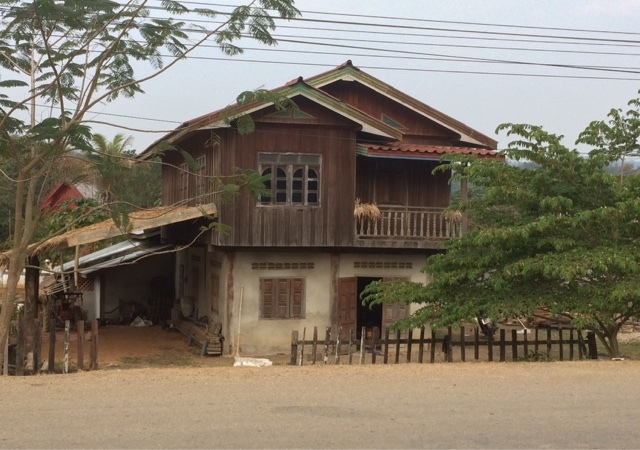 Here in Laos, they also use a combination of the two—concrete block on the first floor and organic (usually wood) on the second floor—that I have not seen in Việt Nam. The only homes I've seen of more than two stories are concrete block... and there are very few in the countryside through which I've ridden. 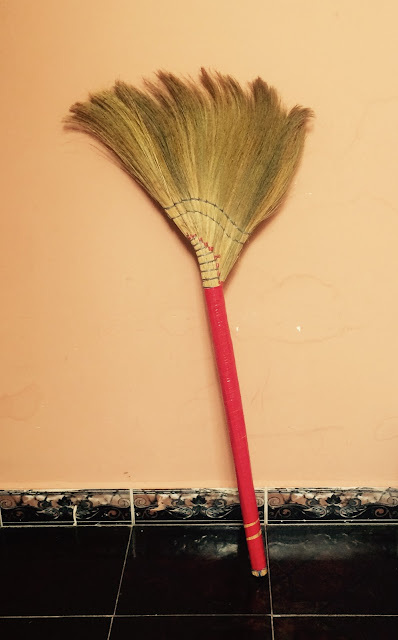 I finally asked a native what they do with the grass once they're done beating it—it's made into the beautiful brooms you see at most markets. 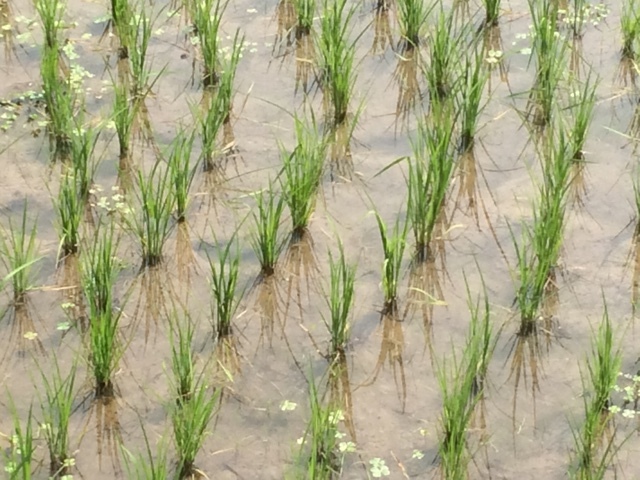 The beating apparently knocks all the seeds, chaff, pollen, and whatever else they don't want off the grasses. Then they set them out to dry. 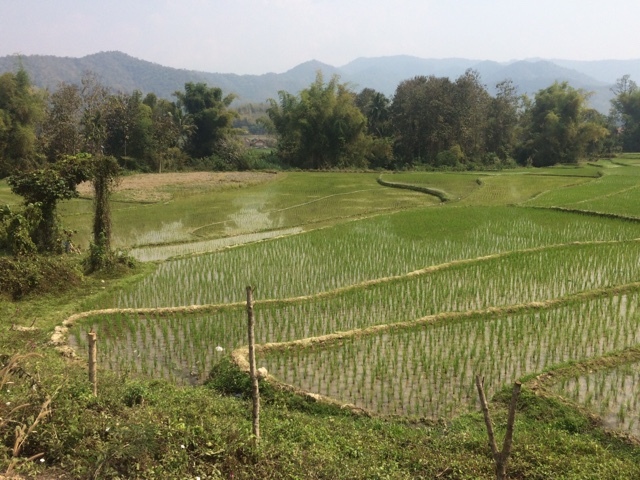 When I rode back by this spot on my way out of Luang Prabang a few days later, there were hundreds of bunches of grasses lying on big tarpaulins, drying in the sun. Eventually, they're wrapped, trimmed, and sold. 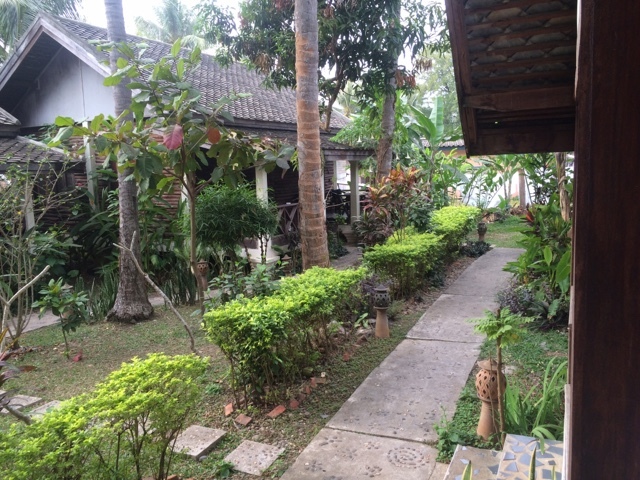 My room tonight is at the Bellevue Bungalows in Luang Prabang. I managed to find it rather easily and was looking forward to a place that I pictured sleeping for the next two/three nights... a quaint cottage in the trees. Unfortunately, the booking agent apparently can't count to five and "my" bungalow for the night was not available—so they "upgraded" me to a plain, soulless villa that could have been anywhere. I'm pretty sure someone decided to extend their stay and rather than move them to the villa and give me what I'd already paid for (non-refundable, of course). Oh, well. What the Agoda.com listing does NOT tell you is that the property is on the approach/departure route for the LP airport; that dogs bark at whatever pretty much all night; that the roosters start their cacophony at 4 a.m.; that a nearby neighbor revs his motorbike for 3 minutes or more at 6 a.m. every morning, and that it's quite a long walk over and back via the "Old Bridge" to get anywhere of interest. The latter was really a non-issue because I need/want to walk 8 km or more every day. The loose planks of the walkway dropped 5-7 inches under my foot only once, giving me an unrequested adrenaline boost. Bottom line, I recommend staying elsewhere. If I ever get back to LP, I'm going to stay at Nam Khan Riverside Hotel, No. 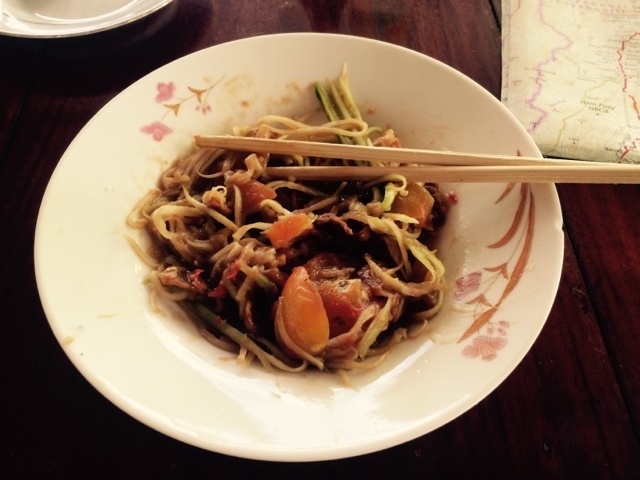 20 Phousi Road, Luang Prabang Old Town, (namkhanriverside@gmail.com). I am going to request either room 15, 17, and 16 in that order—second floor with a balcony overlooking the river. Or anywhere else that's NOT Bellevue Bungalows.